The Mazzer Kony Electronic Low RPM Commercial Burr Grinder has the capacity to hold up to 2.9 pounds of beans and features smaller 63mm conical burrs, plus an internal fan to guarantee uniform coffee grinds every time. Made of stainless steel, the Kony features a stepless adjustment control, which allows for on-the-fly adjustment of the grind. You'll also find a digital display with a shot counter. Large Hopper - Super large hopper holds four pounds of beans. Too Much Machine? 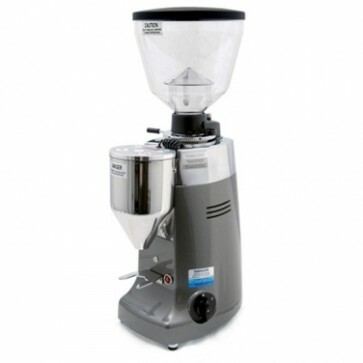 - This is a high quality, high quantity commercial style grinder. Make sure the features fit your home needs..